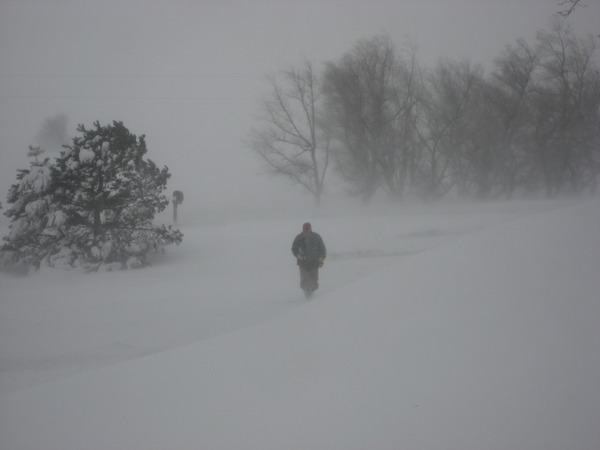 The 2009 Blizzard Through the Tweets of Two Farmers - JP loves LIFE! As the calendar clicked over to Christmas, I posted a blog entry on some of my thoughts about staying home for the holiday. Staying home was like a dream because I travel a lot and while I LOVE travel, the change of pace sounded like a fantastic idea. I took time to point out that a few farmer friends would also being staying home… caring for the livestock that becomes meals for those of us who are consumers. At that point I had no idea what “staying home for the holidays” would really mean for them! As I tapped out my blog post, Mark McHargue was one of the farmers that immediately came to mind. He and his family has a hog farm in Nebraska and had already been letting those of us on twitter know what was happening in his part of the world. Debbie Borg is another of my tweeps and her family has cattle. Both of them produce corn and other row crops — and while weather was tough on a lot of farmers, Debbie wrapped harvest right as the blizzard was headed her way — an incredible one-two punch! I’ve focused on the tweets related to weather & livestock related but both of these folks have a lot more they offer up on twitter. Living in New York for a few years, I got somewhat accustomed to snow storms. The worst storms I saw were nor’easters — what I would describe as a hurricane that dumps snow rather than rain. I remember having the snow drift overnight so badly I couldn’t get out of the apartment til Sal dug me out. I spent long hours huddled in front of the TV and suddenly having the urge to bake (it helped warm the apartment!). I’d walk around the neighborhood a bit & snap photos. While I would dig out my car and at times that would take hours, I’ve obviously never experienced the sort of weather the plains has endured the past several days. And while several college friends have been in the midst of this one, not very many of my college friends had to fight the snow the way some of my farmer tweeps have! I wanted to share their story. For those who don’t use twitter & are not familiar with some of the ways it works I want to give a few tips before you read the timeline. Since you are limited to 140 characters per update, using 4 for “for,” R for “are,” and others are common. They replying to questions or comments from a few folks — @jplovescotton is me and @JeffFowle is a rancher in California — Debbie’s husband is farmer1 :). The pound sign (#) serves as a way to search for the word that follows, there are quite a few we use often. Mark’s using #farm, #food and #agchat since some of us follow frequently. #HSUS refers to the Humane Society of the United States — an organization many farmers & ranchers point to as trying to eliminate livestock & meat production (Advocates for Agriculture has several posts that will provide more info). December 26 & so far on December 27, Mark’s battle with the snow continued and we’ll be watching it for a while yet as the snow has stopped but drifts keep taking over the roads. Fighting a snowstorm has never been so tough for me. I usually take a walk to snap a few photos and spend more of my time avoiding the weather. My biggest concern is usually being sure I have food at the house (& I mean the foods I want to eat at the time). Food that farmers like Mark & Debbie have produced! Give these guys & gals and the thousands of others like them a bit of thanks as you eat dinner or get to decide whether you want to go out during a big storm… do you have the same demands? I sure don’t. Darrell & Jody Donohoe at AgrOpinion who raise have cattle in Kansas. Glenn Brunkow who has livestock in the Flint Hills of Kansas on his blog Dust on the Dashboard. I hope lots of folks read this to see how life really is when the wind blows and the snow falls. 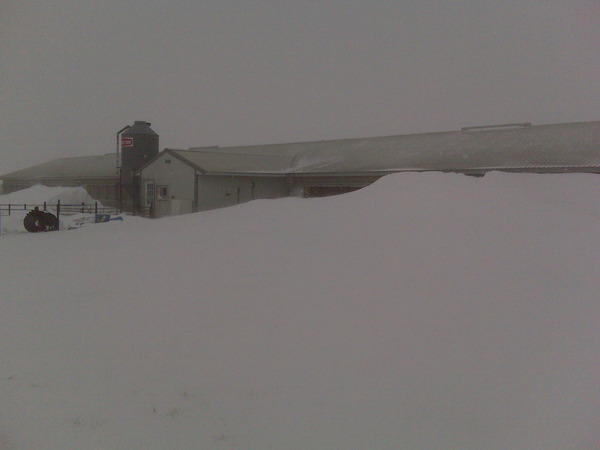 As a former livestock producer I’ve been there and am glad to not have to shovel snow. Hat’s off to all of them. I bet those hog barns feel “Semi-tropical” for their occupants considering the climate controlled conditions they live in! If we didn’t raise hogs the way we do today, we probably couldn’t afford the pork chops and pork roasts that my husband and I love so much! Thank you to the farmers who stuck out the cold weather and snowy conditions as they provided excellent care for their livestock! 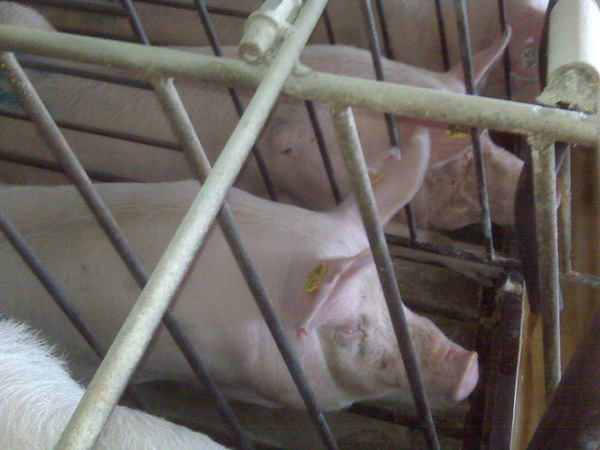 Trapped pigs in cages. Animal abuse. Eric, I disagree as I don’t think pens/cages equal abuse. Although I’m sure some instances can be abusive, a blanket statement goes too far for me. Knowing Mark, I can’t imagine him being abusive to any living thing. How strange… Pigs in “climate controlled facilities” – Pigs in air conditioning and in heated buildings… Meanwhile many humans are turning down their thermostats to save on energy – or to save on the cost of energy. Oh! But that’s right… The government and taxpayers help pay for the costs of heating these warehouses – Never mind… Waste away! Pity though… that much money from people who would never think of eating a pig have to pay for others to do so. I have not received any Government money to heat or air-condition my hog barns not sure where you received that info. As a modern hog farmer I produce 50% more lb. of pork on half as much energy as 30yr ago I call that conservation of our natural resources and am feeding the world more food at the same time. I’m very proud of that! I get the idea that the government buys out so many in animal agriculture from the simple fact that it “buys” so much of this product for the military, schools, etc. If you look at the USDA pyramid of what we should be eating & what is available in Federally funded programs – The pyramid is totally upside down! But I don’t know that you are “feeding the world”… considering there is someone dying of starvation every 10 seconds… If we didn’t feed animals we could be feeding people instead… 6 to 10 times more people can eat a plant based diet as a meat based diet. Unfortunately the cost of animal agriculture is not seen at the cash registers; But exists in poor health, antibiotic resistence, compromised water/air quality, etc. Bea, You seem to have a number of ideas that you would like to discuss with farmers. Are you by chance on twitter? There is a weekly forum on Tuesday night from 8 to 10 pm EST called #agchat where all perspectives are welcome. That gives the opportunity for immediate exchange of ideas, numerous perspectives, etc. That may be a way for you to have more open discussion on the information you would like to put forward. 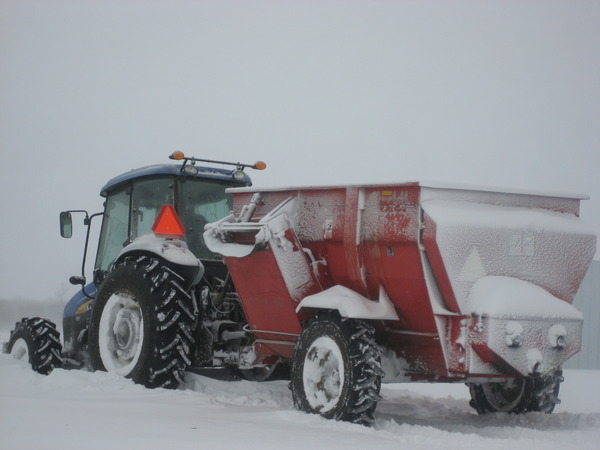 I hope you will understand this blog post was meant to stimulate discussion about the blizzard and the efforts people undertook in their farms. Your comments bring up a lot of ideas to discuss and could certainly generate a number of blog entries and having looked at your blog (http://beaelliott.blogspot.com/), I am sure you would welcome others coming there to read your opinions & provide comment. Janice – thanks for the twitter suggestion. And I have no problem with any visiting my blog. In two years I’ve never deleted or censored opposing views. I appreciate the owner of this blog doing likewise.